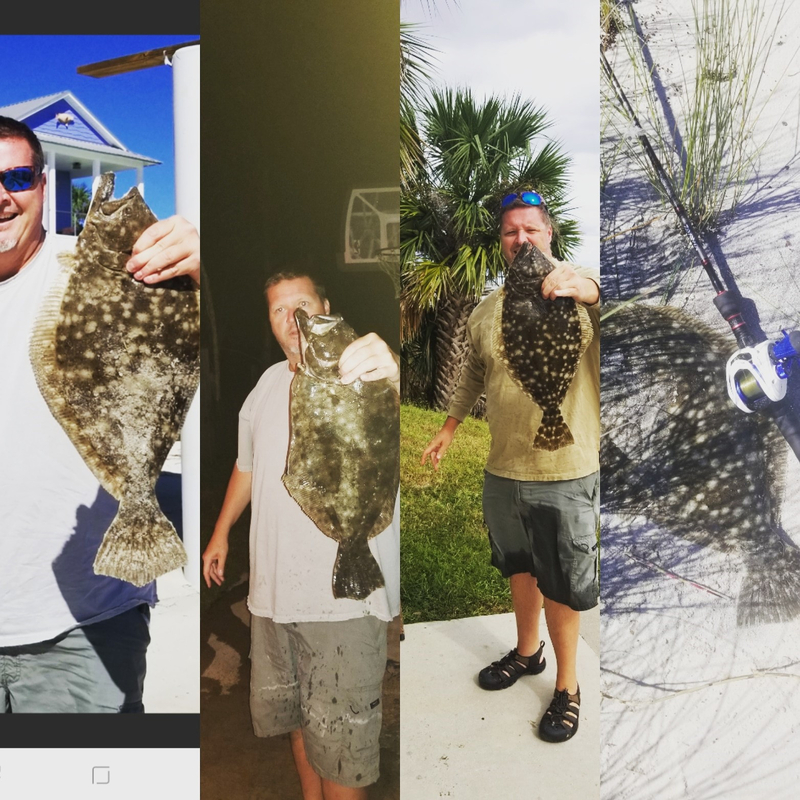 Lets talk flounder! and flounder reports. plan to fish for an hour or two before dark tonight in the vicinity of the ferry slip. will report. What's the report big fish. I got skunked on flounder. Fished from12-4 from sisters to the park. Only seatrout to speak of. Dragged finger mullet off of rocks and docks couldn't buy a bite. Caught 2 small flounder Friday night in gulps. Fishing is still slow looks to be pretty windy Monday so I probably won't go . fished a couple of docks last night in mayport, caught two legal flounder, but they were small. I would say the first was 13 inches so i let him go. Caught another right before i gave it up about 14 inches, so i let him go also. Isn't this about the time the flounder should be stacking up in the river? Sure has been slow for me! I've caught a lot more in the creeks bording the ICW than the river this year. Hey Bigfish, how was the water clarity last night? Not bad really. I was there at dead low tide, but as soon as the water started coming back in i could see fairly well. If you are asking if it was clear enough to gig, i would say yes it was. Maybe this cool front will start them up. I caught 3 small flounder near the ferry slip yesterday evening. They were all about 14 inches. I did get a nice speckled trout also that went 22 inches. Anyone got on the flounder? caught 3 small flounder and a legal red Saturday in haulover creek. ate them last night, was delicious. Caught 6 flounder and a trout last night around some docks on heckscher. The bad news was the biggest flounder in the bunch was about 13 inches The trount was about 16 or 17 inches. Where are the meaty flounder at!!!! Good question - I have not caught one over two pounds at the hecksher docks this year. Got two close to 6lbs for the flounder pounder. Nice job, can you give us an idea how far up the river you found them. i am thinking the bigger fish have not made it to mayport yet. 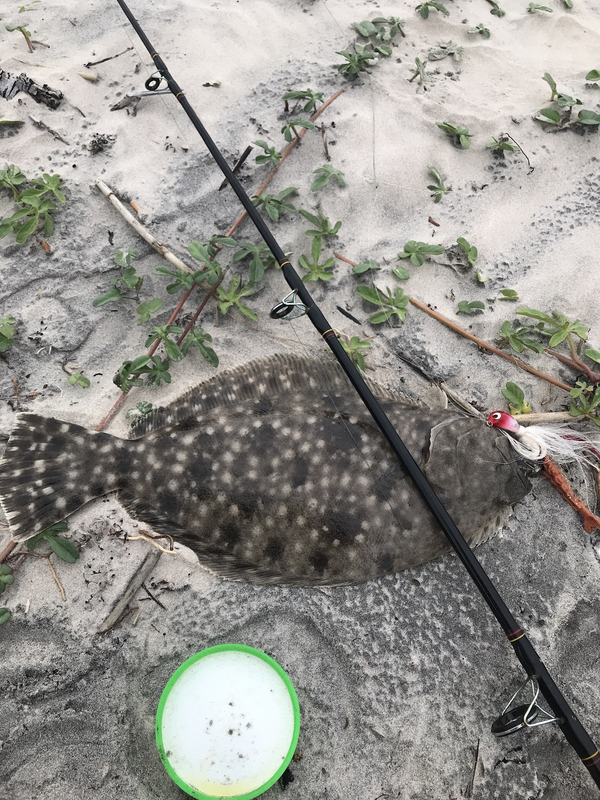 speaking of the flounder pounder, talked to 3 guys who pulled up on the beach next to me in a bay boat to catch bait on Saturday. They said they were fishing the flounder pounder and that they did not have a single flounder at that time and it was about 2pm. I told them i had 3 small flounder and they acted like they didn't believe me. Also, did that get you in the money? I would think so, i have not heard who won, or how big the fish was? In my freezer. Lol. Plenty of big fish around. Lost one probably 8 + today. 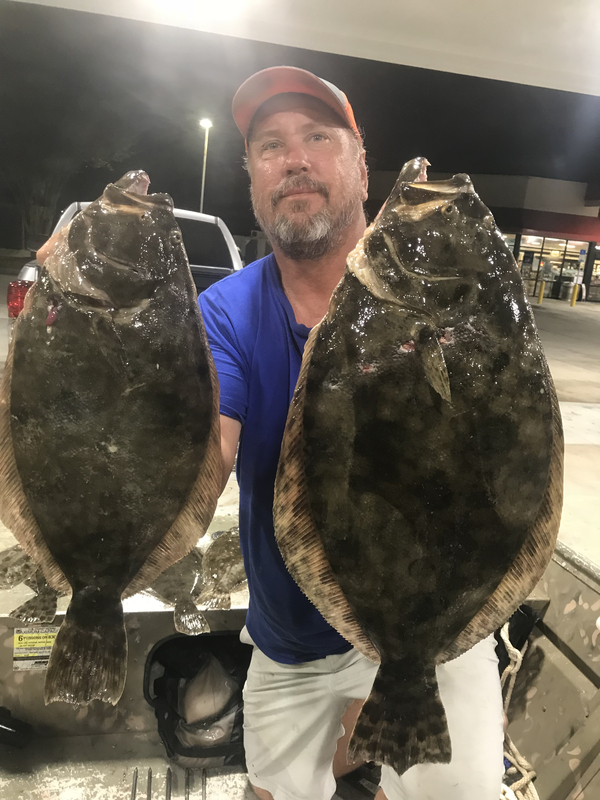 We have been seeing a lot of big prints out gigging and getting a lot of same size fish so they are starting to school up. Just got off the tractor and this is the first thing I went to look at. So darn frustrating that it's only in the last 3 weeks or so that the place has dried up enough to where I can work. So far behind because of all the wet. And right on cue......it's time to fish......right when I an stuck trying to catch up. Matanzas.......anyone got any updates from there? They diffentlly are getting bigger caught 7 nice one from shore Thursday morning before work. Friday the bite was slow managed 3 and my net guy couldn’t get one I had in the net because it wouldn’t fit. Easily over 8 lbs. also got 6 yesterday. Alll on artificial’s. Jimmy. you are tearing them up. We do not want to know your actual spot, "well, actually we do but", what area of the river are you finding your fish. I have been fishing down around the ferry slip. I think the bulk of the fish must still be upriver, but since i am wading from shore it is hard to find areas to fish. Just a general area, orange park, downtown, near the zoo? if you dont want to say i understand. biggest was just shy of 23 inches. Gigged mayport Tuesday night..water was awesome and clear. 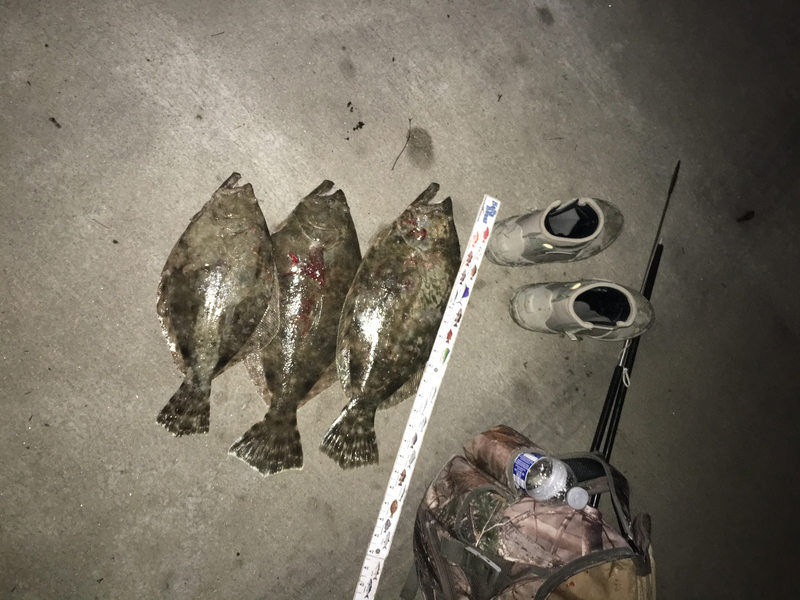 Only saw 2 flounder all night, stuck them... maybe 17''. Saw only about 4 prints all night. Fish definitely not congregated in that area. Never went west of Whiteshell which is probably our problem, just wanted to give Mayport a good try. Hope this helps. thanks for the report, i agree that the bulk of them must still be west of whiteshell. Gigged with a friend tonight at the Nassau sound. We Got three and saw some smaller ones. 20 19 and 17. Was hoping to see more but glad to stick a few. 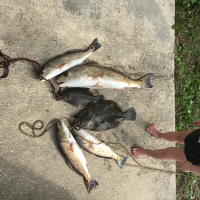 Nice sized fish, a lot of meat off of just 3 fish though. 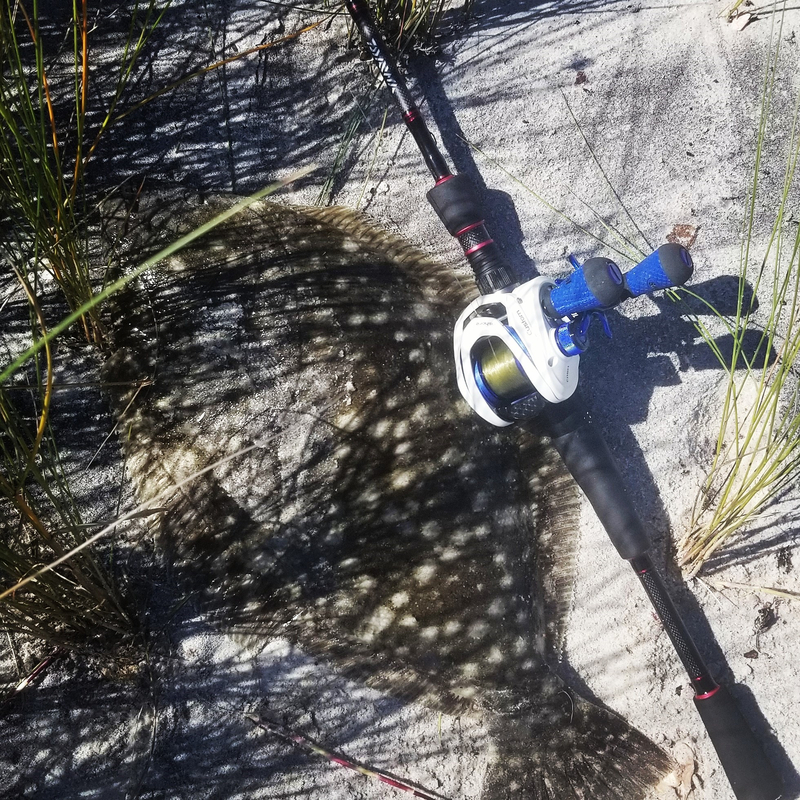 got skunked on flounder yesterday, well i did catch 2 little ones, fishing was definitely off. I had clean water and a current, but no fish. anybody having any success? I cant be the only one chasing these things. im going tomorrow night. ill let you know. sounds good, please post a report. Here is some inspiration, all caught over the last 2 weeks on rod and reel. biggest was 24 inches, but all over 20 inches. 2005 Everglades 290 Pilot. Twin 250 Verados.